It's hard to believe 9 years have passed already, isn't it? I remember that day like it was yesterday, and it has probably crossed my mind every day since. It was one of those crisp September days with clear blue skies, and the details of watching that horror unfold on TV are something I'll never forget. The confusion by all of the TV anchors on the news channels, the images of the people covered in ash, the fear on their faces--I can't even begin to imagine what it must have been like for those who were directly affected by it. I remember calling my Dad, always the voice of reason and logic. But this time, his voice filled with an uncertainty I'd never heard in him, he had no answers. I remember driving into town to get lunch, scanning the radio in hopes of hearing some logical explanation while glancing up at the sky time after time, hoping I wouldn't see airplanes bombing us. In times of terror, we tend to think illogical thoughts, and I actually wondered if we were safe in our little town. Nestled between 2 nuclear power plants, a straight shot across the lake from another major city--Chicago, I began to doubt that we, or anyone at this point, was safe from such attacks. It's odd how I can't remember something that happened last week, but I can recall every element from that day. I remember what I was wearing, what I ate for lunch, oddly enough, even what nail polish I had on. That bottle of Maybelline Pink Shock is nearly empty now, but I still have it...just because. Surely that day was the worst tragedy I have ever witnessed in my lifetime, and hopefully the last one of that magnitude that I ever see. The stories that came out of that day, though filled with sorrow, were also filled with heroics and decency. My faith in mankind could have been all but destroyed by the events that started that day, yet it was actually strengthened in the weeks following, by the stories and images of those who lived through it, and those who sadly, did not. 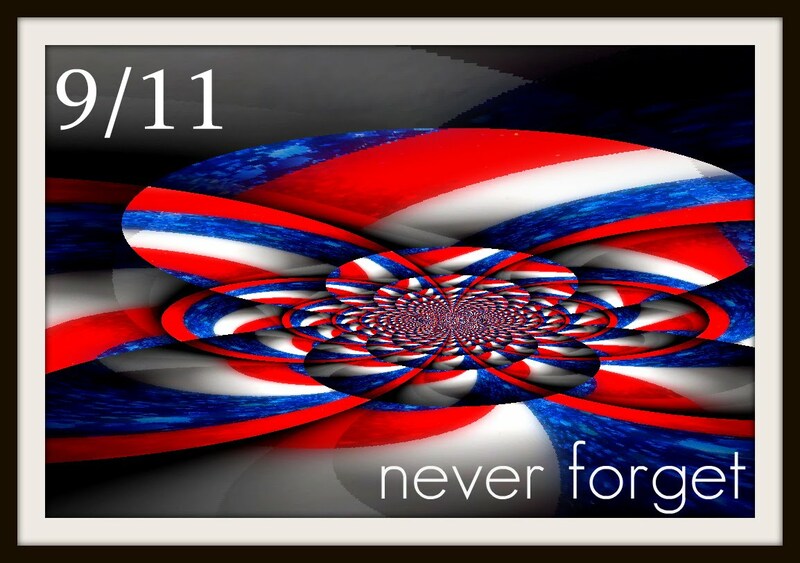 We all remember that day differently--where we were, what we were doing, who we were with--but we all remember. And we'll never forget. Which is as it should be. The image shown was made using macro shots of nail polish and a simple program that came with my camera. I chose polishes with names that I felt were meaningful and appropriate for what happened on September 11, 2001. I used OPI Peace Baby, Lippmann Amazing Grace, Zoya America, OPI Big Apple Red, and Lippmann Across the Universe. yes, it's soo hard to believe that this all happened! I have to think about it today! God bless the people who were killed in that tragedy. My prayer goes out to their families. Wonderful and poignant post. I can't believe the people that are blaming all Muslims for the terrorism. It's insane and scary. There are terrorist in all religions. Too many people have died because of their so called faith. This is a wonderful post. 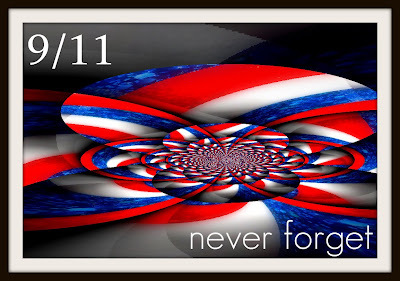 I don't think I will ever forget that day or where I was or the events that unfolded. Thank you for sharing!